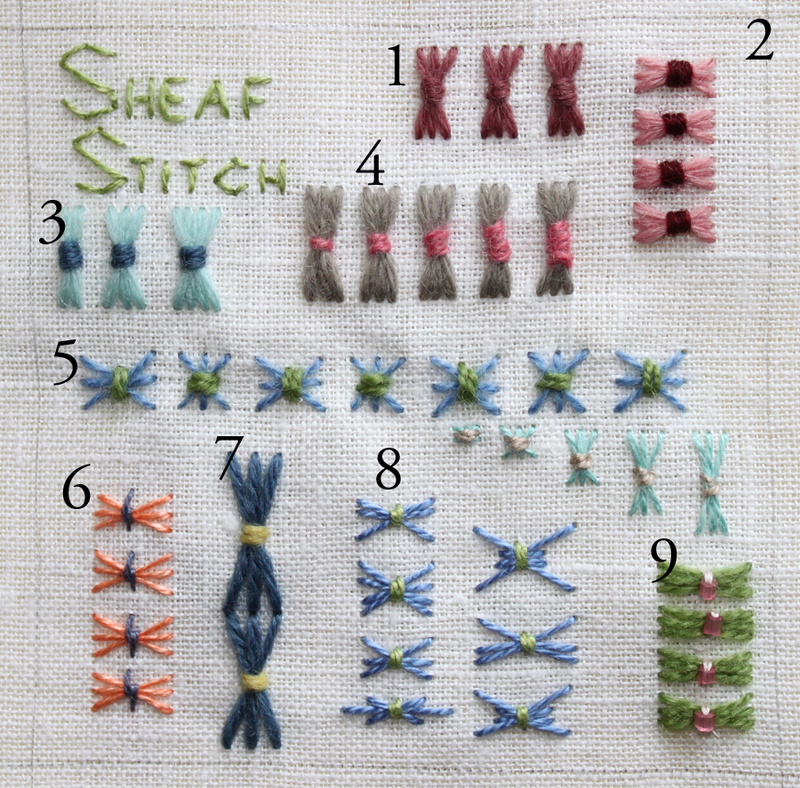 This week's stitch is the sheaf stitch. 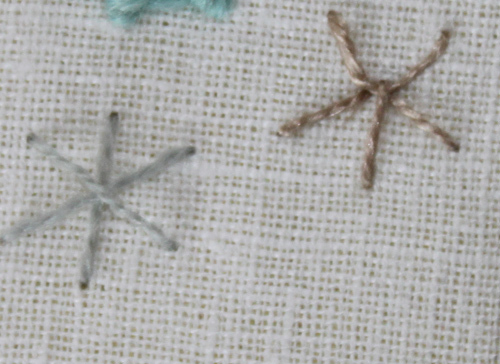 This is a great, little, two-step stitch that you might enjoy working into your embroidery. 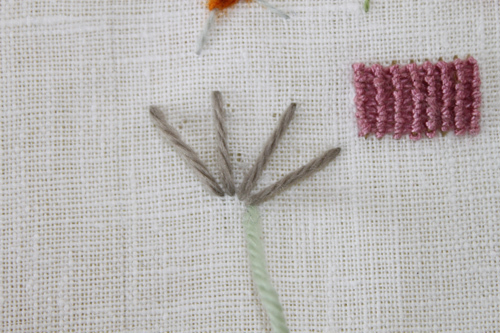 It's sure fun to make, so grab your needles and some thread and give it a try! It's not hard at all. First make 3 vertical straight stitches. Next bring up your needle somewhere under the first straight stitch. 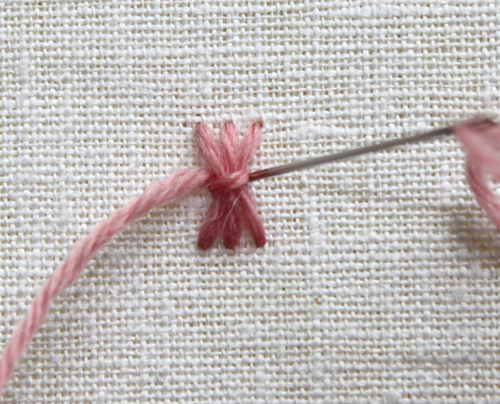 Just push that first stitch over to the right slightly with your finger to make place for the needle. 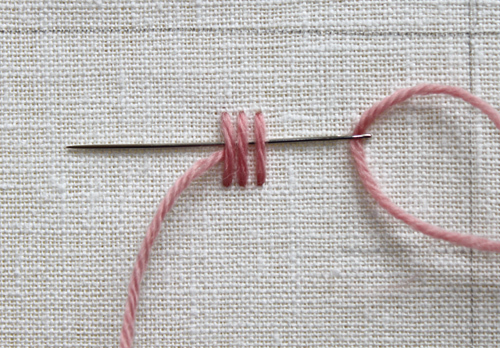 Now wrap the three stitches by bringing the thread over all them and then sliding the needle under them. Then bring the needle down to the right of the little bundle. There is the finished stitch! 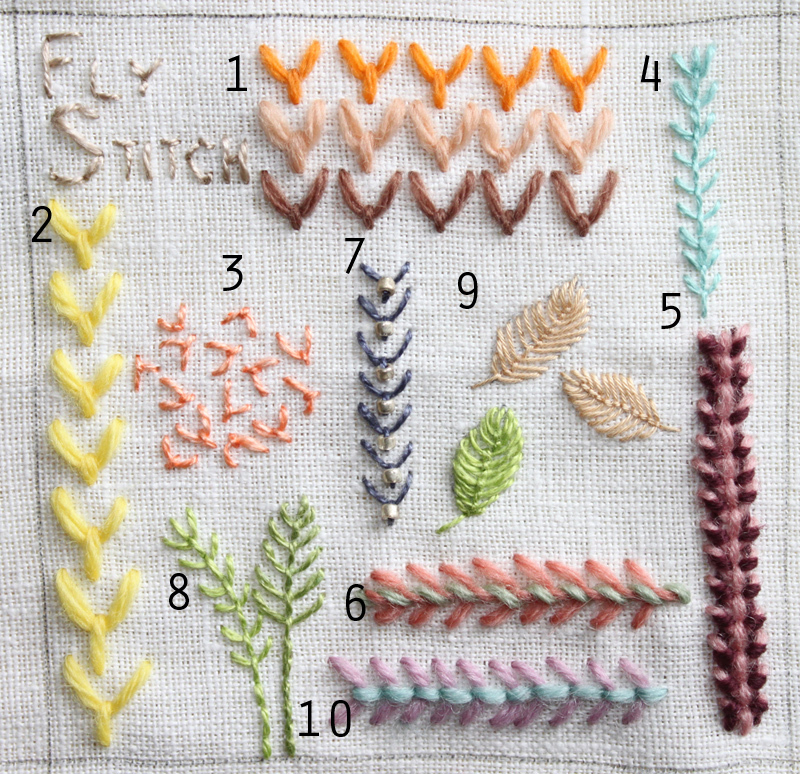 There are quite a few little variations you can try with this stitch. Of course, these are just to get you thinking, there are many, many more to try too! 1. This is a small row of "normal" stitches. 2. 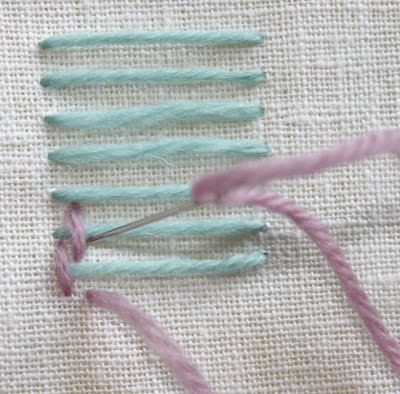 Add some contrast by wrapping the straight stitches with a different color thread. 3. There is nothing that says you must use 3 straight stitches. 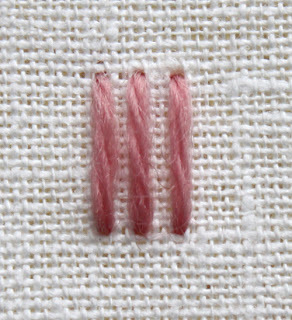 This example has 2, 3, and 4 straight stitches. 4. You can also vary the number of times you wrap the straight stitches. Here 1, 2, 3, 4, and 5 wraps are shown in the example. 5. 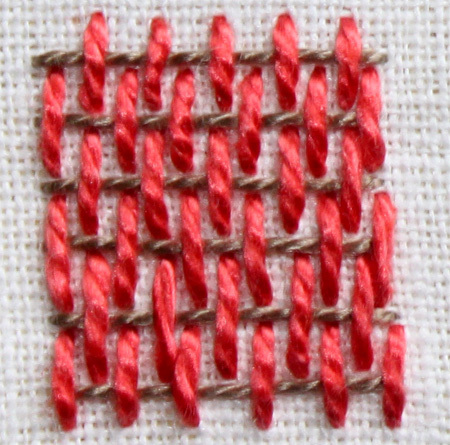 This example shows both alternating horizontal and vertical straight stitches with the straight stitches a bit wider apart. 6. You can extend the wrap if you want too. 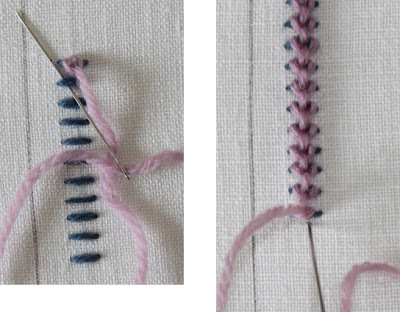 Instead of pushing the first straight stitch over a little, just bring the needle up just on the side of the straight stitch. Wrap under, and bring the needle down in line with the final straight stitch. 7. 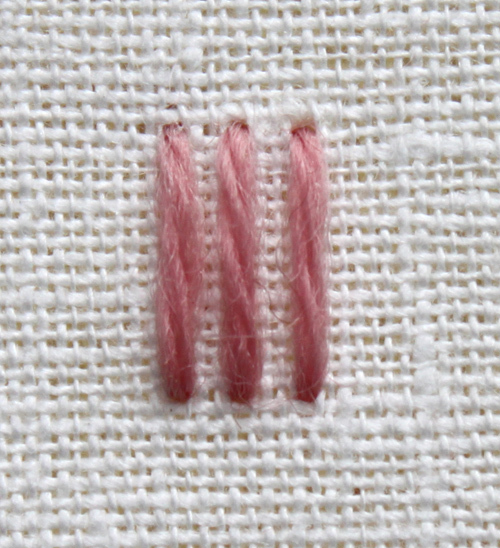 The stitches can be line up top to bottom. This might make an interesting border or maybe a great fill-in. 8. This shows various irregular sheaf stitches. In some the straight stitches are place at varying distances from one another. 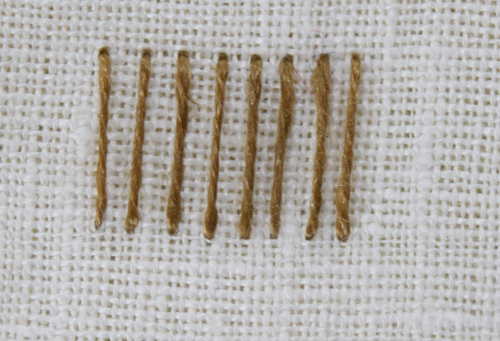 Also the length of the individual straight stitches can be varied. 9. 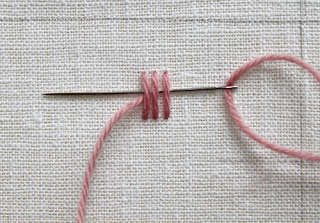 Add a bead to the wrap stitch. 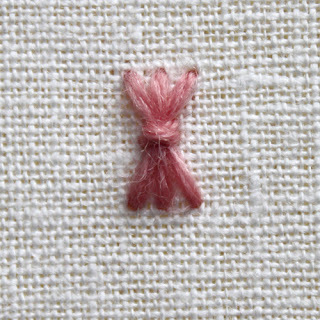 The bead is passed through two times - once before wrapping under the straight stitches, and again after. Week 7 is now complete, but there is still time to join in!! Welcome to week 6 of summer stitch school here at The Floss Box - half way through now. 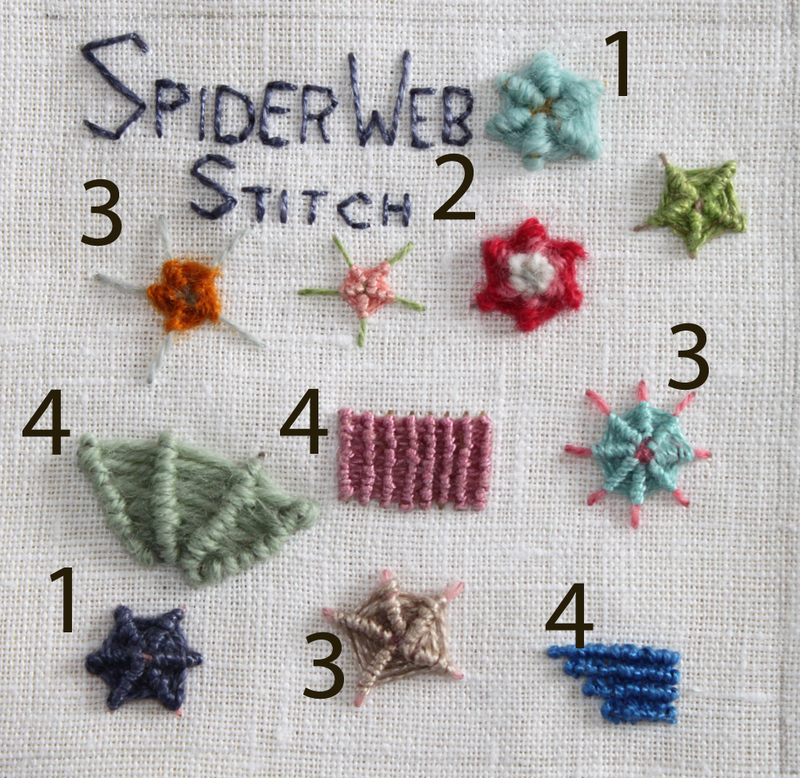 This week stitch is a fun one: spider web stitch. It can add a lot of nice texture too. It can be stitched both as a detail-type stitch or used to fill an area. The stitch is made in two steps. First a set of spokes are bars is made, followed by another length of thread which wraps around each of the spokes or bars. 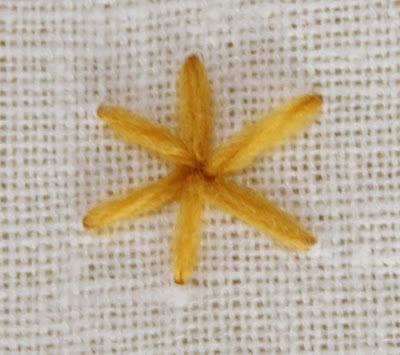 First make spokes radiating outward from a central point. 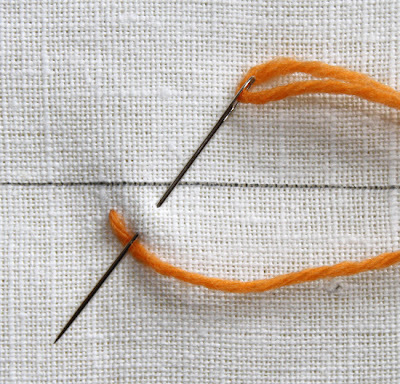 You can either make straight stitches from the center or make stitches that go over the whole diameter of the area to be stitched. 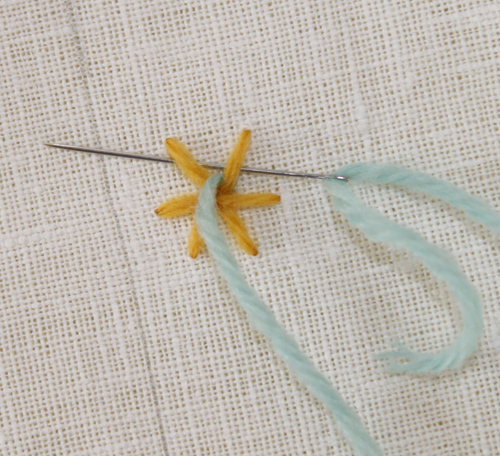 If you are making a 5 point stitch, then you can make one fly stitch and two spokes. Next bring the needle up close to the center. Slide the needle under the first spoke and then over and under it again. You can slide the needle under the next spoke in the same movement. Continue until the spokes are filled. Bring the needle down near a spoke, so that the whole stitched area is even. This shows the basic stitch. 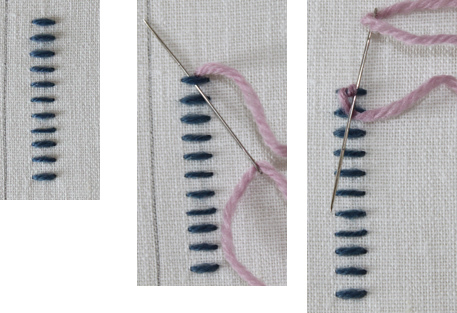 You can change colors as you go along, or perhaps use threads of different thickness for the spokes and wrapping stitch. Also, you can make how many spokes you like, even or odd. You don't have to fill up all the spikes. It can be quite effective with the spokes partially filled. The spider web stitch can be used to fill different kinds of irregular areas too. First make your spokes or bars. Then wrap the threads around them as before. 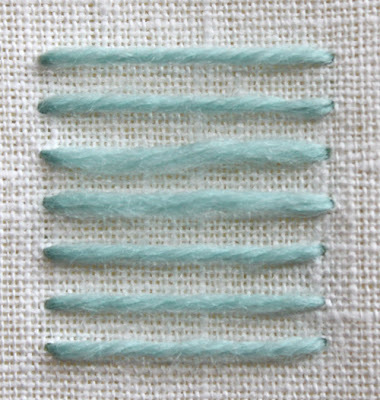 You can bring the thread down at the end of the row, then up again in position for the next row. These are just a few ides to get you started. This really is a great stitch, so pick up your needle and give it a try! Stem stitch, chain stitch, french knot; it isn't often you come upon a stitch that is actually named after someone. The burden stitch is a very old stitch, used during the middle ages. It was re-popularized by Elizabeth Burden, sister to the designer William Morris. 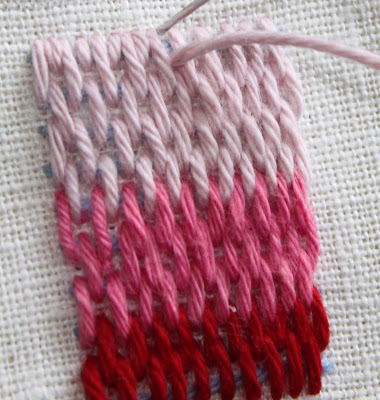 This stitch is useful because it can be used to quickly (or relatively quickly anyways) fill large areas. It has a basket-weave type texture and since it is made in two steps, it is easy to imagine lots of variations. First make rows of horizontal bars. Then make straight stitches going over the horizontal lines going across. 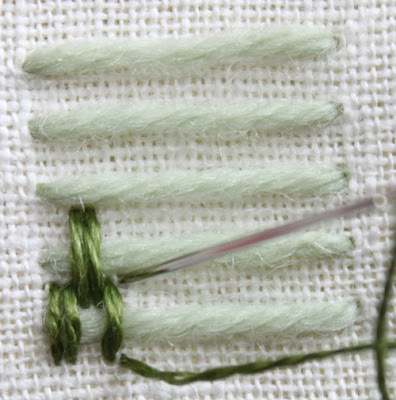 The stitch is started at the top of the lower horizontal bar and extends all the way up to the bottom of the next higher bar. Continue filling in the space with the straight stitches over the horizontal bars. Note that the colors can be changed to give contrast or add shading. They can be varied across the rows too! The first variation, is the length of the vertical stitches. They can be placed so that the horizontal bars end up completely covered if the stitches are placed so that go over two horizontal bars instead. At the top, you can make half stitches so there is a nice, finished edge. (You can do this at the bottom too). Try spacing out the stitches some. They can be very close, or spaced out a bit, depending on how much fabric and horizontal stitching you want to show through. 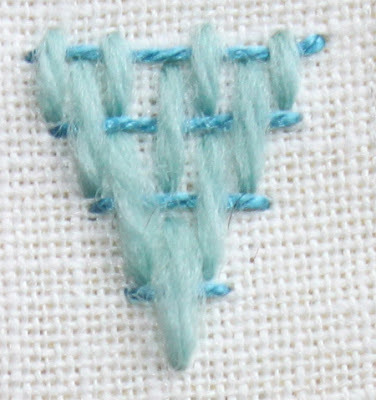 The vertical stitches can be made double. This allows for more of the horizontal bars to show. 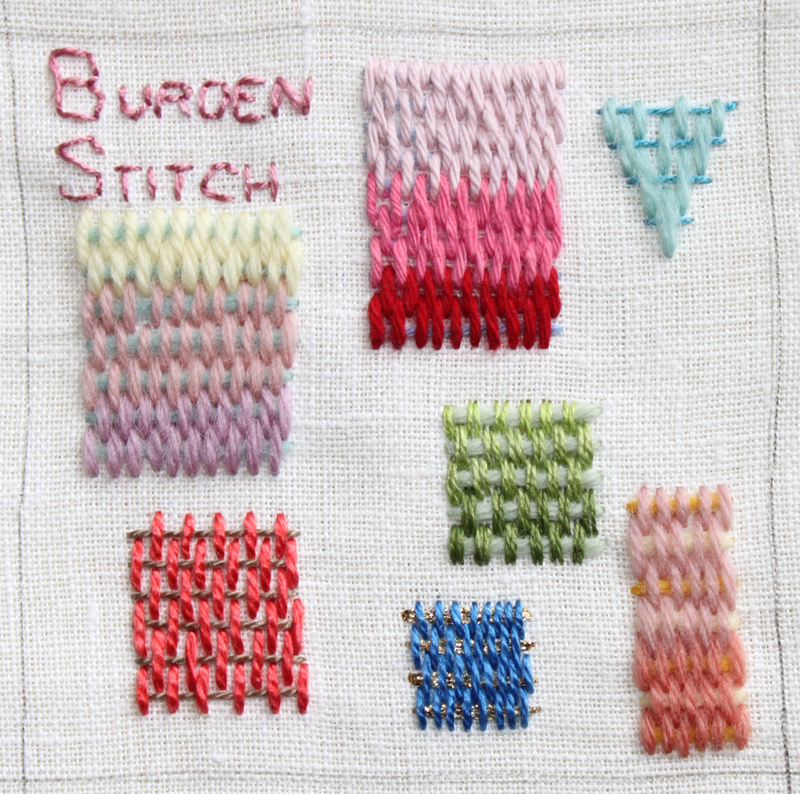 Note that you can have differing thread thicknesses for the horizontal and vertical stitches. The horizontal bars can vary in color too. Use some metallic thread for a bit of glitter! Fill in other shapes too. The diamond shape is well suited, but round shapes can work too, just alter each stitch's starting point as you move down the curve. 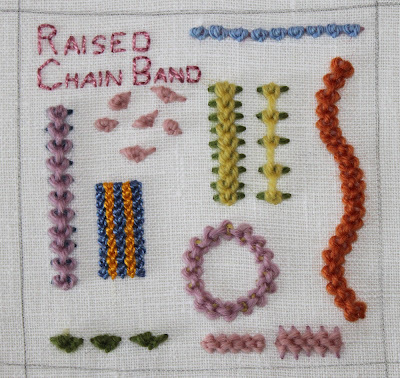 Raised chain band is a nice stitch for adding lots of interest and texture to your projects. It is medium in difficulty, but really is quite easy to master. The stitch is made in two steps, so it lends itself quite readily to lots of variations. Step one is to make evenly spaced horizontal stitches of equal width. 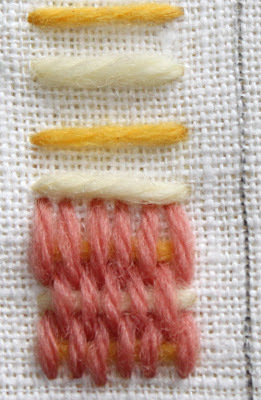 Next bring up your needle up just above the top-most stitch in the center. 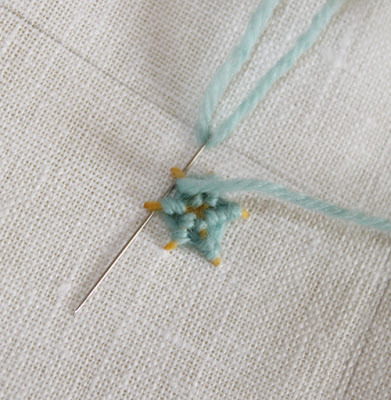 Then bring the needle over and under the top stitch. Next bring the needle under the top horizontal again on the other side of the center and wrap the thread under your needle as in a chain stitch. 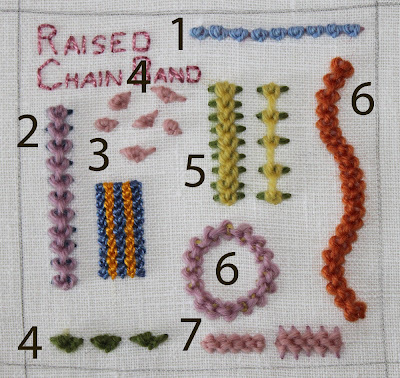 Repeat the stitch by bringing the needle over and then under the next stitch again and then form the chain stitch as above. Continue down the row of stitches. At the end bring the needle down to the back of the fabric. The picture shows some variations on this stitch that I could come up with. 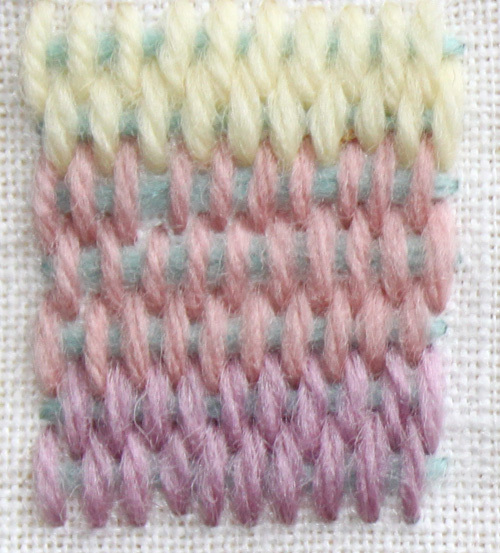 A horizontal row of single stitches line up one after the other. A regular row of stitches. You can do them in many color variations. 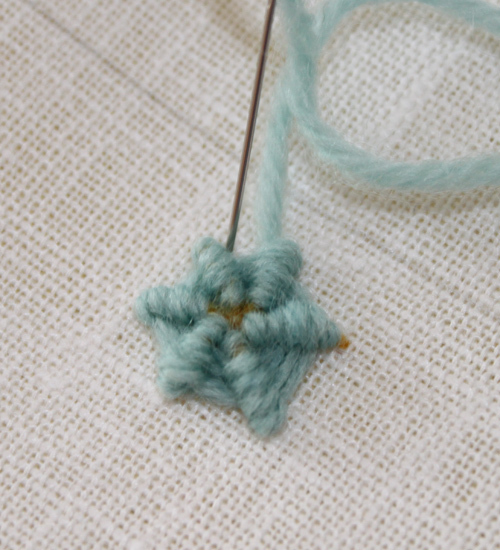 This example has 2 colors, but you can add more color either with variegated floss, or perhaps putting two different colored strands on the needle. This is an example of a filled area. The horizontal bands are wider such that several line of stitches can be made. 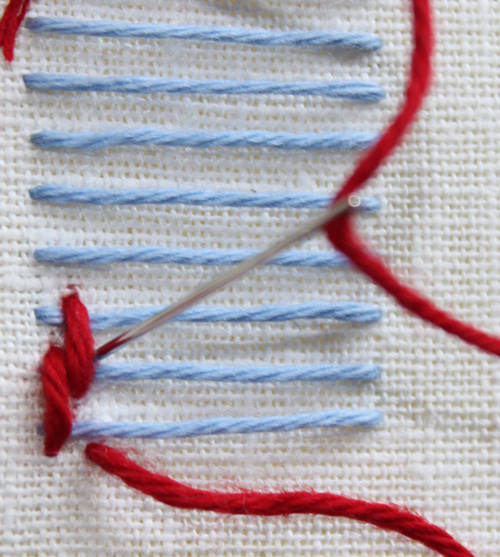 If you do this, make sure the horizontal stitches are not too loose. Don't pull too hard on the chain stitches as you make them or you will distort the horizontal stitches. Also, if you are filling an area more than an inch or so in width, make more horizontal bands across the width. Be sure to overlap them a bit, so you don't get strange breaks when you make the rows down. 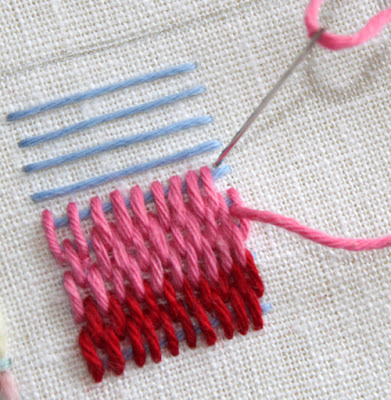 Single stitches with different widths for the horizontal stitches, or try them lined up evenly with a small space between. This is a comparison with the horizontal bands close together and farther apart. Curves and circles are no problem. Just make sure to space the band stitches closer on the inside of the curve and a bit wider on the outside, like spokes. 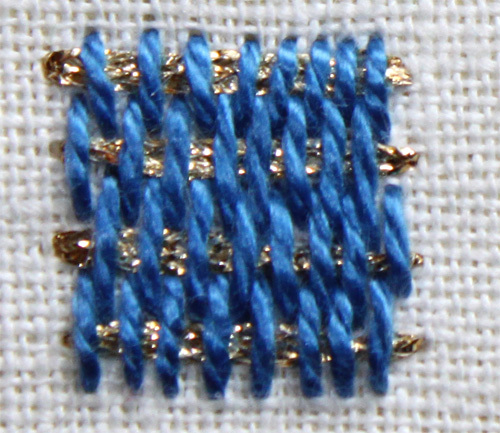 Here you see a comparison of wide and narrow horizontal stitches. I didn't even get to making variations with beads. 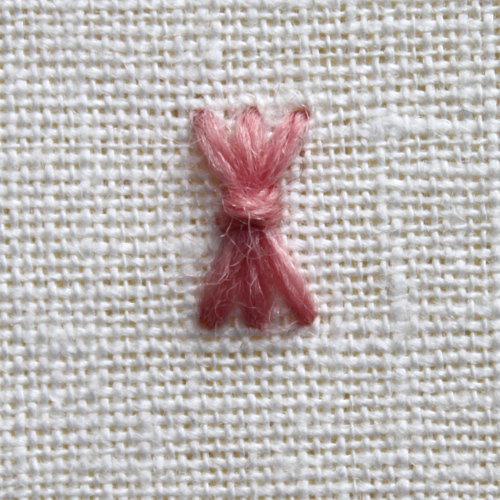 It should be quite easy to add a bead at some point where you make the chain stitch. 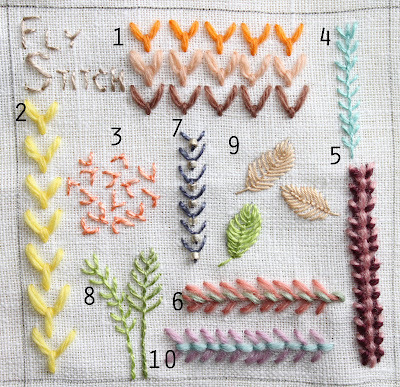 This is a great stitch to try! It's well-suited to tree trunks, for example. Other things with a bit rough texture could be interesting too, such as rooves or flower stems.